ACTING MDC Alliance leader, Nelson Chamisa , yesterday read the riot act and warned his detractors, particularly top MDC-T officials, against plotting to derail the coalition project ahead of this year’s general elections. 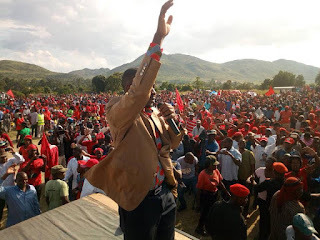 Addressing a campaign rally at Chisamba Grounds in Mutare, Chamisa who is standing in for ailing MDC-T leader Morgan Tsvangirai, declared that the alliance was “irreversible”. “The MDC-Alliance is irreversible; there is no debate about that. We are very loyal to it. If you have ulterior motives, then you can cause divisions. This is about people and this is about people who have suffered and the alliance is on the electoral act,’’ he said. When NewsDay later called him after the rally, Chamisa became evasive and declined to discuss the matter, saying he preferred talking about bigger issues such as preparations for the elections. This came amid reports that some top party officials in Mutare had attempted to sabotage yesterday’s rally by absenting themselves while others distributed posters falsely indicating the venue as Sakubva Beit Hall. Since its birth in August last year, the coalition pact has faced several glitches and a lot of resistance mainly from Tsvangirai’s lieutenants who viewed it as a means to accommodate former “rebels” — particularly Tendai Biti and Welshman Ncube, who now lead the PDP and MDC but have joined the MDC Alliance. Other parties in the coalition are Transform Zimbabwe (Jacob Ngarivhume), Agrippa Mutambara (ZimPF), Mathias Guchutu (MCD) and Denford Musiyarira (Zanu Ndonga). The bone of contention has been the sharing of seats among the seven parties in the coalition pact. In the MDC-T camp, friction over the alliance escalated over the past few weeks after Tsvangirai left for further treatment in South Africa, leaving Chamisa as acting coalition leader. This reportedly projected the youthful Kuwadzana East MP as potential MDC-T and MDC Alliance presidential candidate in the event the former Prime Minister remained bed-ridden. The move has, however, triggered fierce internal fights with other MDC-T vice-presidents Thokozani Khupe and Elias Mudzuri reportedly snubbing alliance rallies addressed by Chamisa. Both Khupe and Mudzuri did not attend yesterday’s rally, although the latter was at last week’s rally in Epworth, where he was allegedly assigned a peripheral roll of giving “a vote of thanks” besides being acting MDC-T president. Party insiders said Mudzuri immediately protested at being side-lined and tempers only cooled down after other Alliance partners intervened. But Mudzuri yesterday dismissed the allegations saying he had many tasks assigned to him by Tsvangirai, hence could not attend all MDC Alliance functions. “I think those are things that we can talk about and solve. We want to work together and unite people. I am a mature person and I don’t have time to squabble with anyone,” he said. Contacted for comment, Khupe, through her aide Witness Dube, said she would not be drawn into the succession debate in the MDC-T.
“While it is the media’s privilege and duty to speculate, analyse and make permutations about any issue it deems to be in the public interest Dr Thokozani Khupe will not add her voice to the media smog on an issue whose timing she believes is unAfrican, inhuman, undemocratic, and altogether steered by misdirected interests hell-bent on running parallel to constitutionalism, Ubuntu/Hunhu, and the founding culture and values of the party,” Khupe said. Khupe said it was not time for canvassing, but praying for Tsvangirai who is battling colon cancer. An MDC-T insider in Mutare told NewsDay that resistance to the MDC Alliance had permeated grassroots party structures, hence the discord over preparations for yesterday’s rally. “There has been an attempt to sabotage the event with some top-ranking members in the MDC-T behind the sabotage. The People’s Democratic Party PDP saved the situation. People like Giles Mutsekwa and Tatenda Nhamarare (Mutare mayor) want the alliance,’’ the source said. MDC-T Manicaland provincial chairman Trevor Saruwaka confirmed the hitches in organising the rally, but denied the sabotage reports. “I think those are usual negative news created by enemies. Our provincial executive reiterated on Friday that they are in support of the alliance. The delays by our organising department have to do with lack of financial support and this has purely to do with our ecomomy,’’ he said.